April 2016 - my name is Food. Brunetti was on one of the places to go to for desserts or sweets on my list when we went to Melbourne. Since we were having dinner at Lygon St, we decided to go and find Brunetti. What we did not realise was that the queue and how packed it was. I had to wait for a while until the crowd had died down to even take a photo. Since Brunetti has relocated from its previous venue, it is now at least about three times the size they were before. Having a huge bar to serve customers coffee, tea and other sorts of beverages, it is a order-at-counter but then you do have to take it yourself when it's ready. Serving a wide range of cakes, pastries, savouries and more, it is sure to fit with any tastebuds. Plenty of seating available however it can get over crowded sometimes and you may get a seat at the corner without any view. We both were quite full after having dinner at Lygon St, but we just had to make some tummy space for dessert. We ordered a 'Flat White' and a 'Cappuccino' and waited as our cakes arrived. 'Sfogliatella' is a baked flakey pastry with sweet ricotta cheese and citrus. Simply look at its many layers, the Sfogliatella is a unique, petite pastry dish you should not miss out on. 'Hazelnut and Coffee Torte' ($7.6) is an elegant yet unique cake consisting of a flourless hazelnut sponge layered with a mocha mousse dusted with icing sugar. Although it did say it had a Hazelnut sponge in between the mocha mousse, it had also some sort of flaky pastry amongst it as you are able to hear the crack and also trying to slice or fork a bit was quite hard and not as easy as you would on a normal sponge cake. The mocha mousse was the highlight of the dish, it was not too sweet but it was rather just right. The Hazelnut sponge allowed the whole cake to have the balance between sweetness, density and also fluffiness. It was a great combination in having a Hazelnut sponge and mocha mousse, of course if you wanted it more simple, you could've opter for a vanilla custard or just simply cream in between but by having that mocha mousse allowed the dish to be taken to the next level. This reminded me of Mille Feuille but not having a vanilla base or a simple thin puff pastry in between and to hold it altogether. Having the hazelnut sponge cake and the mocha mousse created an elegant dish as well as giving you a different taste rather than the traditional Vanilla Slice. If you aren't up for either cakes or any sweet nibbles, there is a Gelati section at the end of the strip as well as some savoury items on the menu. Ying Thai 2 is a branch of Ying Thai at Lygon St, Carlton. 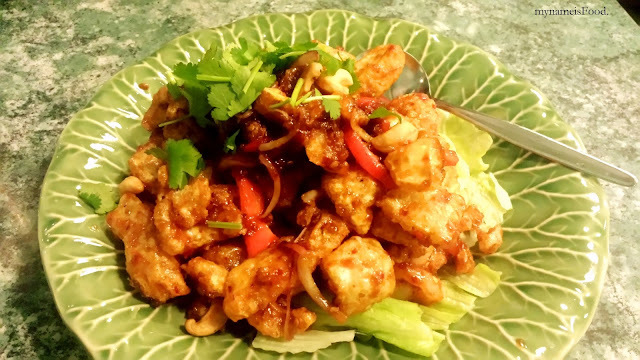 Although I would usually not eat Thai food or any other type of cuisine other than Italian here at Lygon St, my other half had told me that he wanted to go to Ying Thai and that there was a dish that was a must-try. So, without further discussion, we decided to head our way there from the CBD. Ying Thai is an authentic, humble and very green Thai eatery. There has been many buzz previously about this place but every time I do go to Melbourne, I tend to wander off elsewhere, by what I mean is that I would go to other restaurants to eat or to try. When you do try look for it, it may be very crowded and you may have to wait for a bit for a table but they do serve their dishes pretty quickly. Plus, indoor and outdoor seatings are both available. Many artwork of traditional cartoons on the whole left side of the restaurant's walls. 'Yum Sam Grob' (Crispy Pork Skin: $14.9) is a mixed salad with prawns, squid, vegetables and their special sauce topped with Crispy Pork Skin. You may choose Crispy Fish skin if you would like a more seafood based and/or if you do not want pork. I wonder why this dish is so popular and I quite understand why. Being presented nicely in a green leaf plate (which actually reminds me of a similar plate I have at home as well..) and topped with coriander, it may seem like a healthy dish when you know you are ordering a salad. 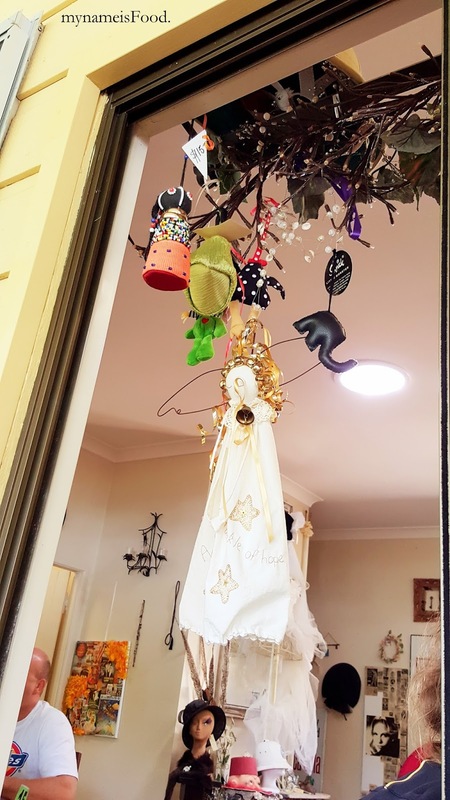 But then, when it comes out, there seems to be more meat/seafood than the mixed leaves which I am not going to complain since it is great having a salad but then the meat or toppings isn't limited as many salads do tend to have more greens rather than its dressing or toppings. 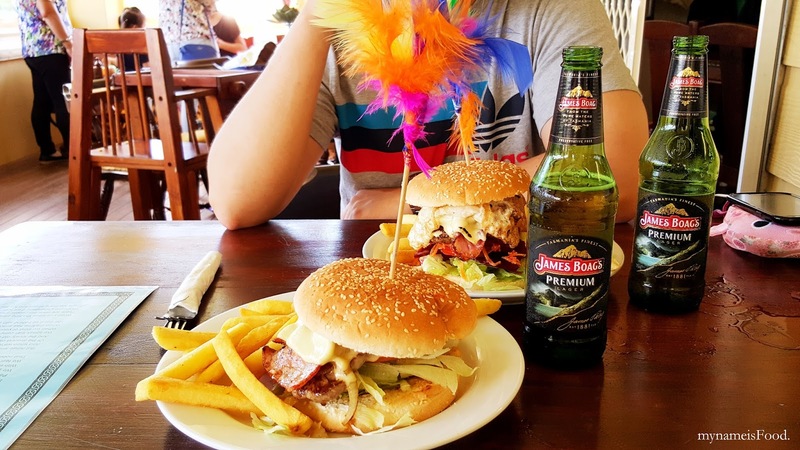 When ordering this, remember that this would take you to Thailand, bringing you street food but served nicely and you are eating at a proper restaurant. 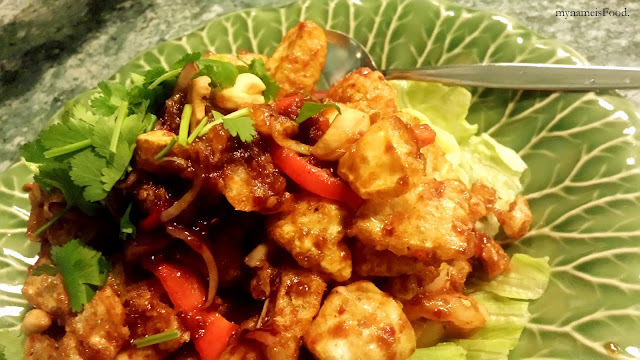 Another thing that I may add is that with this dish, you will be able to get your buds tasting the sweet, salty and sweet, as well as crunchy and crispy through each of the different elements within the dish. The salad is placed at the bottom so do give it a good mix if you prefer but if not, then start digging into the well marinated prawns and squid giving you a sweet but sticky as well as a salty base then go into your Crispy pork skin and I have to say that they are not stingy with the portion and cutting. The Crispy pork skin were great, big chunks and crispy throughout with a more tangy but sweet marination as well. Having cashews and the salad as well as onions and tomatoes here and there allowed the dish to have a brightness and also makes it more refreshing than the warmth of the cooked seafood and hot crispy pork skin. Be careful as it can get a bit spicy for some but just right for others. It was a bit spicy to me but then my level of spiciness that I can handle isn't much but I did not mind it at all, even if the spices were hitting my tongue, I still wanted to dig in for more. A must have and it will leave you smiling throughout the meal. 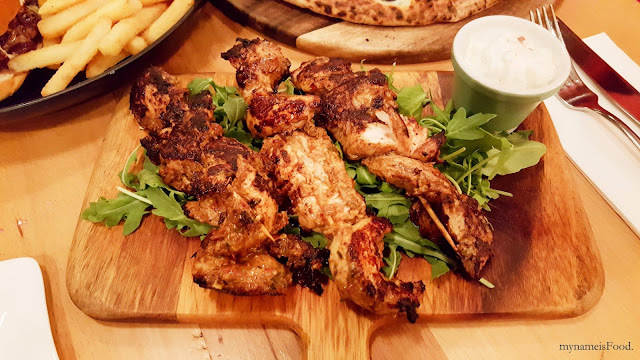 A great dish to share as I don't recommend it having it alone as it can get quite repetitious in terms of taste and also it's better to order a few dishes and try as many as you can with your friends or family or date. 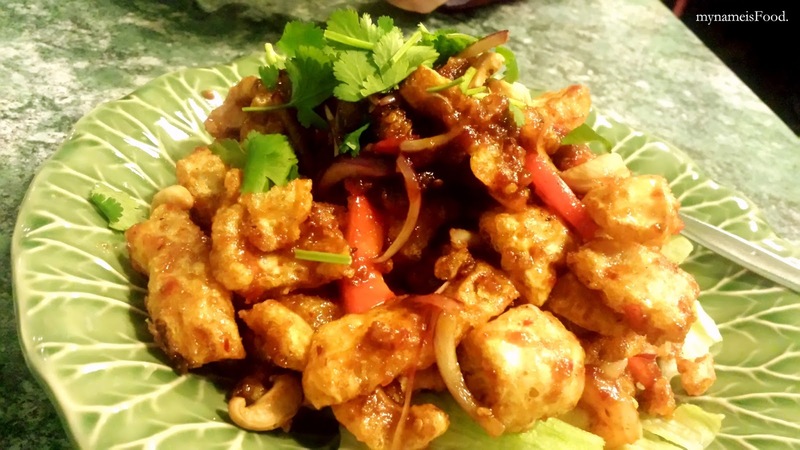 No wonder this dish is popular and what everyone raves about when they hear about Ying Thai. 'Pud Thai' (Chicken: $15.90) is a classic Thai noodle dish but this is one of the noodle dishes I always opt to buy rather than the other options. A thin rice noodle stir fried with the meat of your choice with bean sprouts, vegetables, dried shrimpes, crushed peanuts and egg. Sounds simple? But when you do have a taste of the dish, you then realise why every Asian country have their own traditional, classic and signature rice or noodle dish. Having the crushed peanuts on top allows you to mix the noodles when it arrives in front of you to have that equal amount as well as balance. 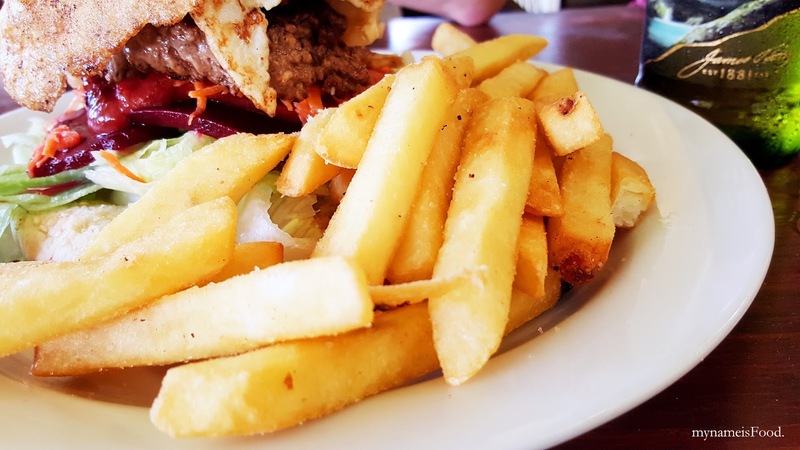 If you do have peanut allergies, do tell the waiter when you order so that they won't put it on top or even, you could ask for it to be put aside. I'm sure they won't mind. The pad thai was rather sweet overall and the soy sauce colour was not very visible but amongst it, you can taste the garlic, chilli and the other spices they have added in combined well and made the dish delicious. 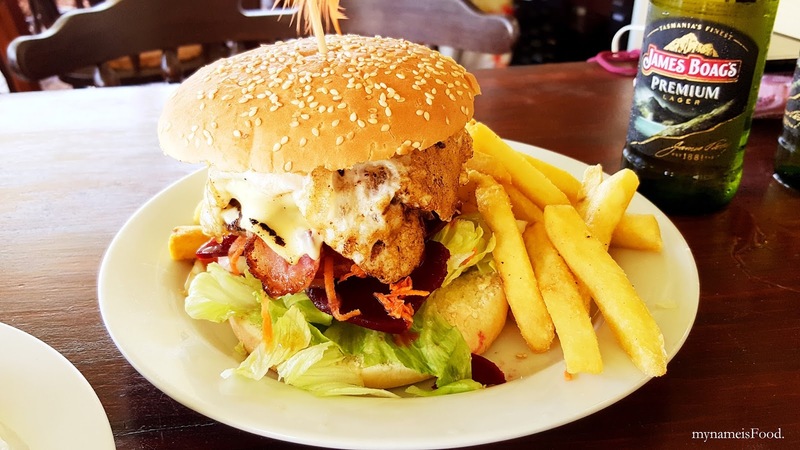 The Springbrook Cafe and Bar is located in Springbrook at the Springbrook General Store and Cafe. A humble setting but the general store has your grocery essentials if you need to grab some things as well as a cafe offering your a variety of burgers, mixed deep fried food as well as fish and chips an so on. Oh, and did I mention they also have a bar? 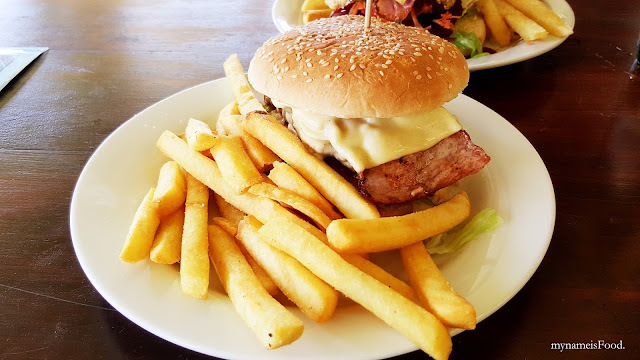 If you aren't sure of where to go and grab a bite to eat while you visit Springbrook National Park, then have a try here especially if you like burgers and fried food. 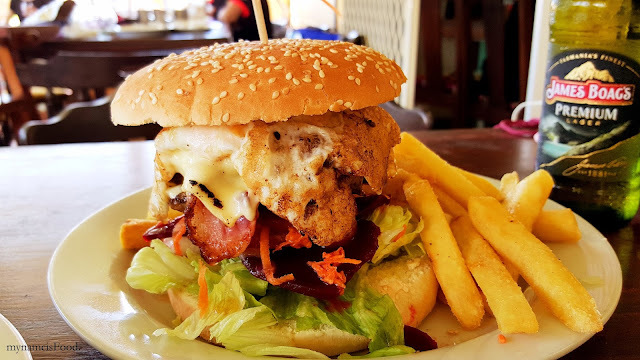 'Mountains Best Burger' ($15) is the whole deal if you love your burgers and want the whole shaa-zang in one bite. All burgers are served with chips too which is great. Home made beef patty, lettuce, tomato, beetroot, carrot, cheese, onion, egg, bacon and pineapple on a toasted buttered bun.. Really? All of that? Yes! Though it was too big for me to hold and even take a bite out of it fully, I did manage to take a number of bites to be able to get all of the elements in. The chips were fried nicely and was not too oily nor salty which is just perfect. 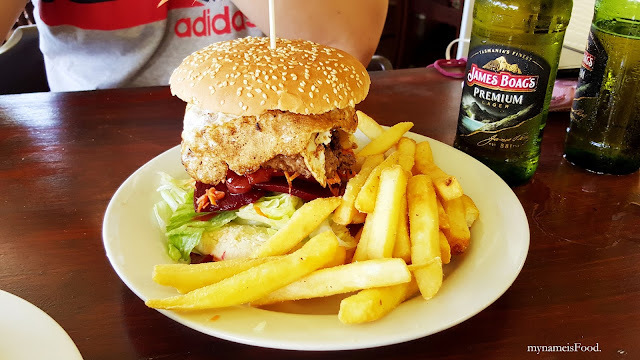 As for the burger, it was quite tall I have to say and it does get messy while eating. But remember that delicious food will always leave you messy and with sauce on your lips so don't worry too much. The buttered bun was toasted lightly and having the butter on the bun didn't seem to have much of an effect on the burger since it had a lot going on already. As you can see, even the burger on the plate seems already a heavy little thang but imagine how will you be able to pick it up nicely and try and bite it without having those elements spill out. Remember to pair it with a nice cold beer on the side to give you the whole meal deal. 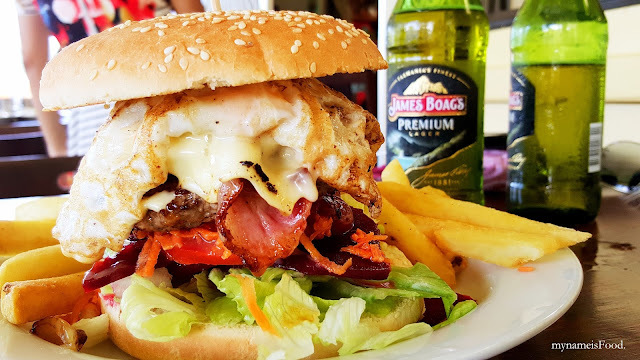 The home made patty was juicy and quite thick and by combining your typical bacon, egg and various salads such as lettuce, tomato, beetroot and carrot, you kind of feel healthy in a way eating a burger that has a salad in it but then, yes... it does have bacon and cheese. But who can say no to bacon and cheese? 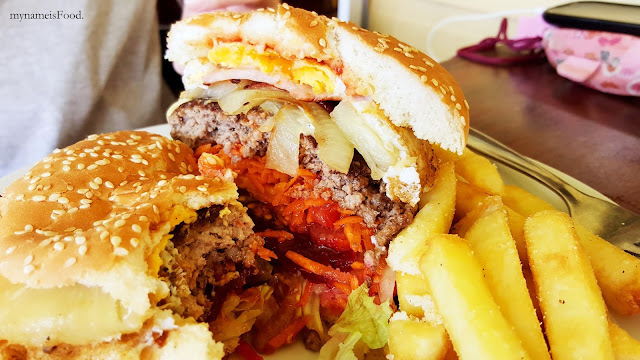 You can see the amount of carrots, onion and so on carefully placed into the burger. Even your local burger store may not be as neat in preparing and serving burgers on your table. 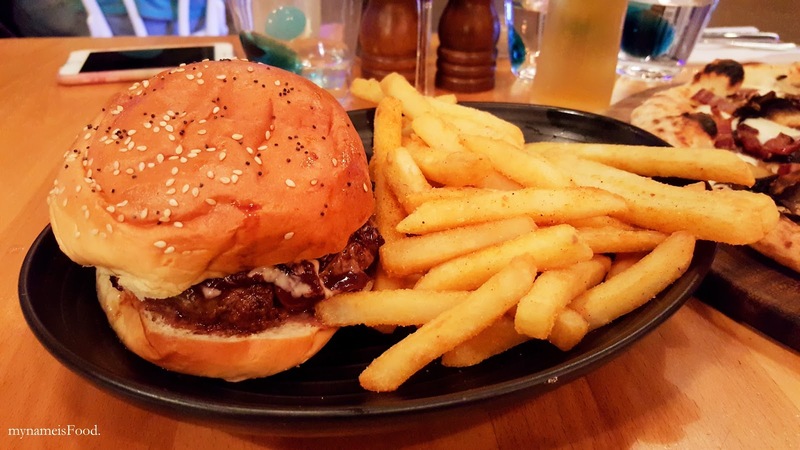 'Steak Burger' ($12.50) is a simple but yet delicious burger alternative to have if you like a meat fillet more rather than a meat patty in your buns. 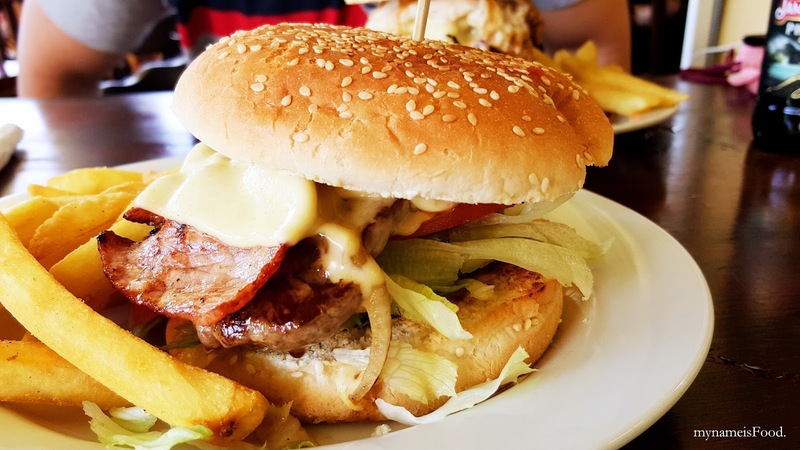 Steak, lettuce, tomato, onion, bacon and cheese on a toasted buttered bun served with chips. Although it is smaller in size than the previous burger, but it has the same size bun so it's just the fillings that's different. The toasted burger bun allowed the burger to have a slight crispyness allowing you to have that slight crunch when you bite through it. 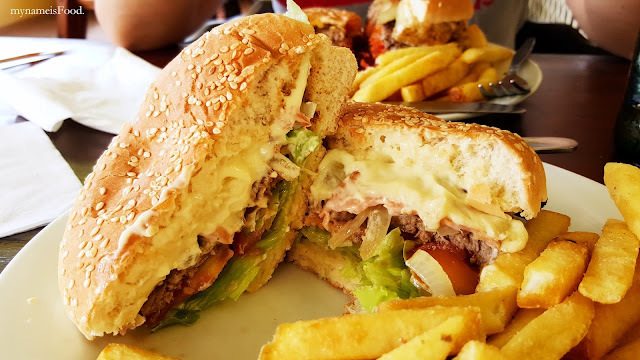 When eating a burger, remember to squeeze it with two hands and if you are planning on sharing, just grab a steak knife and cut it in half right through the middle. What seemed to be missing may have been bbq sauce for some reason, although I love mayonnaise and it was a nice dressing for the steak burger but I feel that by having mayo, it does take the steak burger down a level being a subtle burger. Buzz Bistro at Gasworks is known for their wood fired pizzas as well as their breakfast variety. Though I've been here for both lunch and dinner, I am yet to try their breakfast next time. 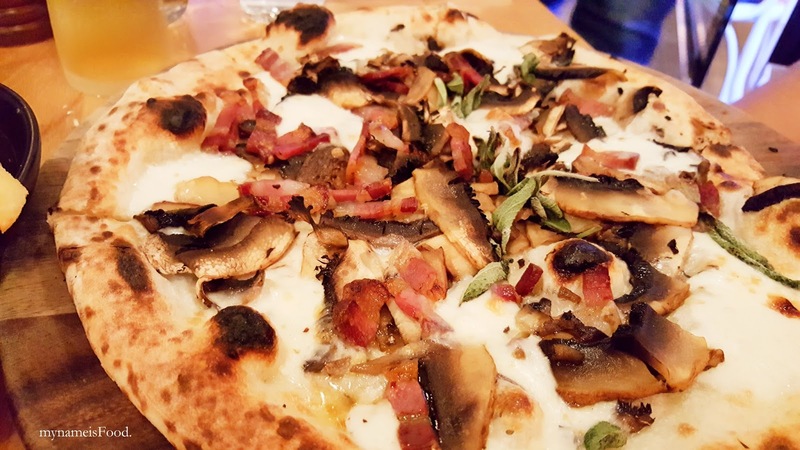 Creating artisan Neopolitan style pizzas allows you to enjoy good ol' Italian pizzas hand made as well as being able to smell it while it's being cooked in the wood fire. Don't forget to order a glass of wine or maybe a nice cold beer to accompany it. 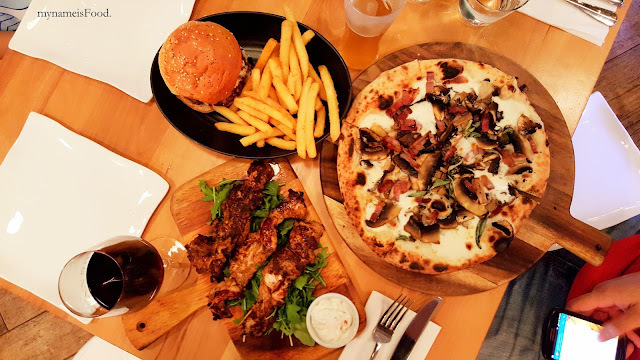 Having a view of the Gasometer, allow yourself to indulge in good food while relaxing and watching the different lights shining upon the thick steel lining. 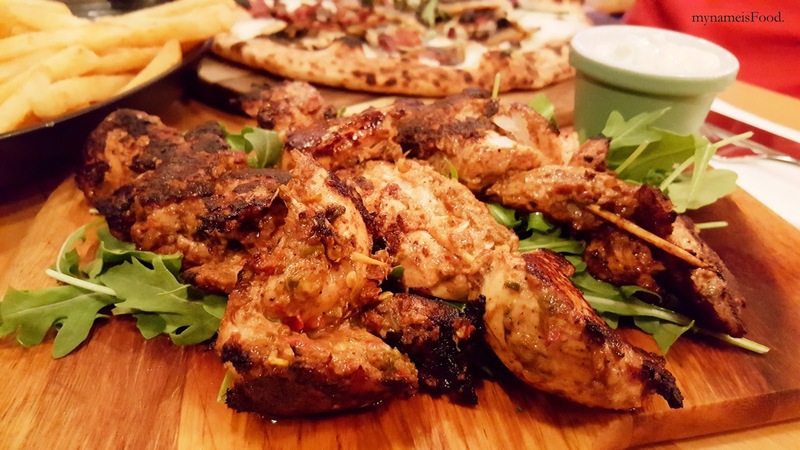 'Buzz's Famous Jerk Chicken with Chorizo Skewers' ($14) with cucumber and mint yoghurt is a great starter to have and to share amongst your friend or your loved ones. A simple but yet delicious dish to have. The jerk chicken was seasoned and marinated well, mixed along with the chorizo created a nice balance and giving it hints of saltiness through the chorizo. Having the rocket underneath allows the dish to have some greens and make it look not as lonely just by having the skewers by itself. The cucumber and mint yogurt was a refreshing yet smooth dip to have and blended well with the skewers. A nice sub for your typical ketchup or mayo. 'The Rage'N Sage'N' ($19) which is one of their pizza options which consists of sauteed mushrooms, garlic, crisp sage, Fior di latte and pancetta. Mushrooms and pancetta always works well on pizzas, especially when together. It would have been great however if the mushrooms were scattered more reasonably rather than only being closer to the center mostly. 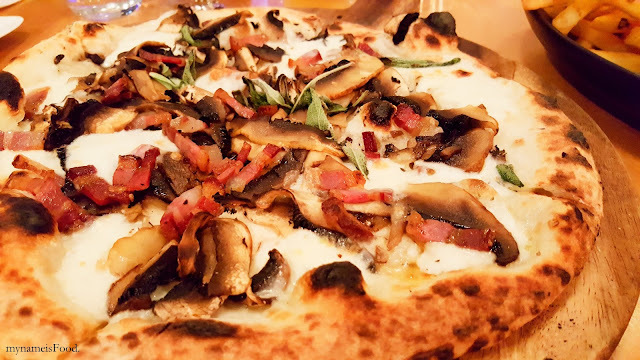 There were still a sufficient amount of pancetta pieces as well as mushrooms but again, the mushrooms could have been more around the pizza slices. Fior di latte is a type of cheese, a semi-soft, fresh cheese made in the style of an Italian mozarella. 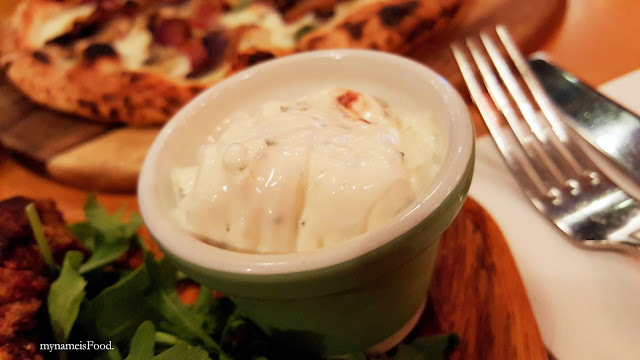 The Fior di latte has a smooth and a little tangy in flavour also, having an elastic feeling. The thin dough was chewy and crispy but not too thin until it gets soggy easily. 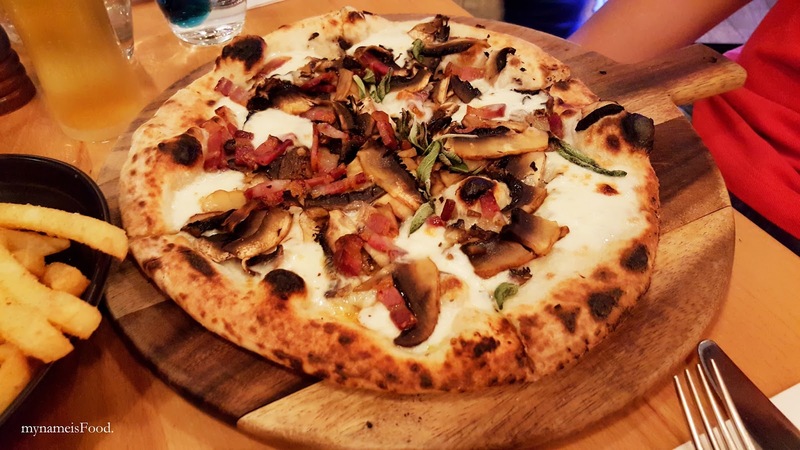 Having the burnt bits from the wood fire oven makes the pizza more authentic and have the smoky flavour as well as smell. 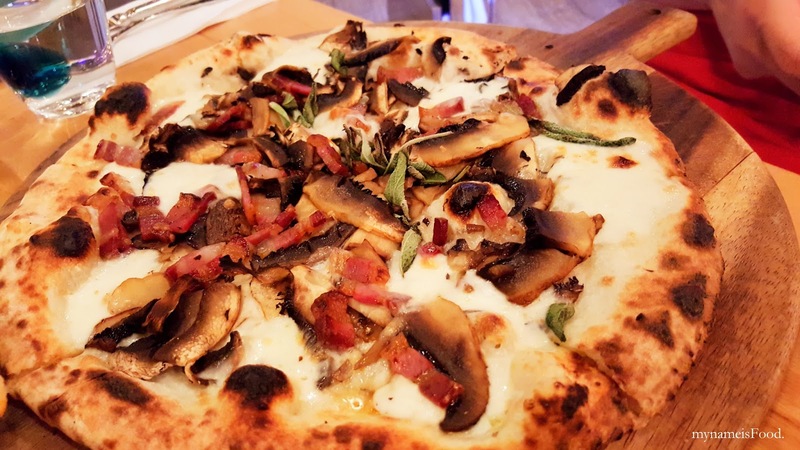 One of the nicest pizzas offered here so do have a try. 'The Blue Cheese Burger' ($19.5) is one of the seven different burger options on the menu. With all the burger and pizza options, you would have trouble trying to decide which to choose. 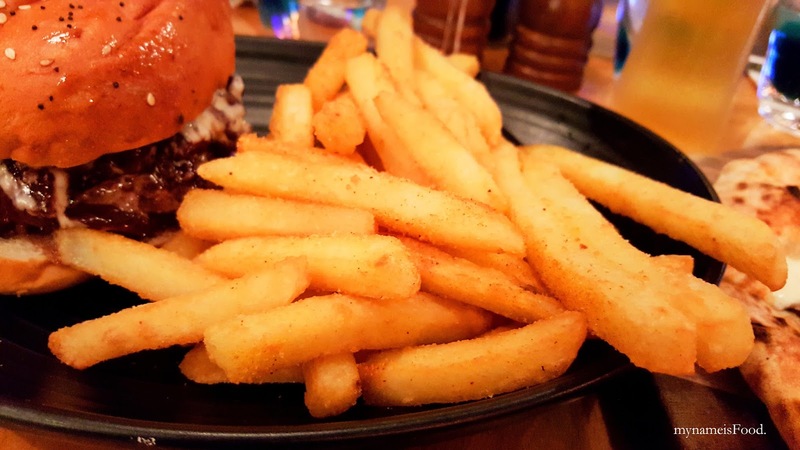 All burgers are served with 220g wagyu beef served medium rare with a choice of salad or beer battered chips. By using Gorgonzola piccante, it allows the burger to have a soft and buttery but also quite salty in terms of taste. The mayo allowed a creamier texture as well as having the house made red onion marmalade gave it a nice balance. I really enjoyed the red onion marmalade as I thought it was unique and had an interesting picklish taste. 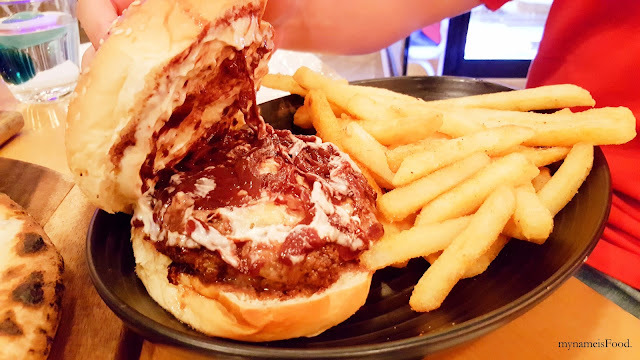 A Gorgonzola Piccante is a veined blue cheese made from unskimmed cow's milk and has a strong and an intense taste when eaten alone but with it being mixed into a burger, created a different yet interesting way to try the cheese as it blends in well with the red onion marmalade and wagyu meat.